Canthigaster rostrata is the scientific name for the sharpnose pufferfish. This tiny fish can be found hovering the Key West reefs. However, the sharpnose pufferfish camouflages well with the reefs, and it’s hard to spot. 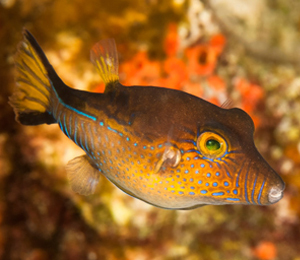 The sharpnose pufferfish is delightful with its kaleidoscope of blue lines that contrast with its golden eyes and protruding nose. True to its name, this fish inflates itself when threatened. It’s a stress reaction and defensive behavior to surprise and ward off predators. Although this fish is just four inches in size, it can inflate several times its size. Many times, you’ll find the sharpnose pufferfish hiding in sea grass beds, mangrove roots, sea plumes and erect sponges. Just seven miles off Key West’s coastline is the Florida Keys Reef. With areas of shallow reef waters, it’s the ideal venture for snorkeling in Key West. The Florida Keys Reef is the only nation’s living coral barrier reef and extends for 120 miles. The reef is teeming with marine life, including green moray eels, blue-striped grunts and colorful sharpnose pufferfish. It’s one of the more versatile marine destinations on the globe. In addition, there are coral-encrusted shipwrecks that feature intricate and interesting coral formations. Snorkeling in Key West is at its best at the Florida Keys Reef.